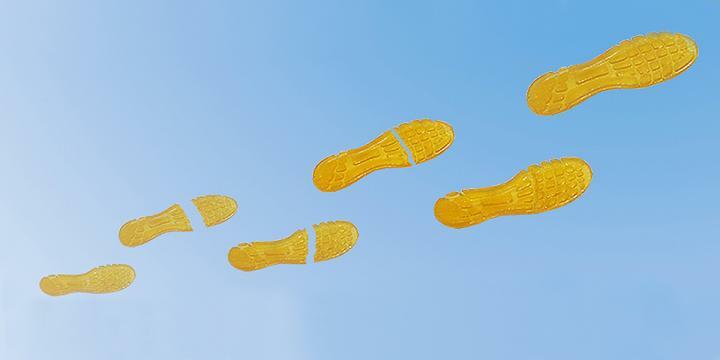 A new 3D-printed rubber material developed by researchers at the University of Southern California Viterbi School of Engineering means that perhaps we won’t have to trash our worn down shoes. Instead, we can simply let them self-repair. Assistant Professor Qiming Wang works in the world of 3D-printed materials, creating new functions for a variety of purposes, from flexible electronics to sound control. Now, along with Viterbi students Kunhao Yu, An Xin, and Haixu Du, and University of Connecticut Assistant Professor Ying Li, he crafted a new material that can be manufactured quickly and is able to repair itself if it becomes fractured or punctured. This material could be game-changing for industries like shoes, tires, soft robotics, and even electronics, decreasing manufacturing time while increasing product durability and longevity. The material is manufactured using a 3D printing method that uses photopolymerization. This process incorporates light to solidify a liquid resin in a desired shape or geometry. To make it self-healable, they had to dive a little deeper into the chemistry behind the material. In the video below, the material is used for a soft robotic actuator that is able to lift a weight before and after being cut in half. In just five seconds, they can print a 17.5-millimeter square, completing whole objects in around 20 minutes that can repair themselves in just a few hours. They demonstrate the material’s ability on a range of products, including a shoe pad, a soft robot, a multiphase composite, and an electronic sensor. After conquering 3D-printable soft materials, they are now working to develop different self-healable materials along a range of stiffnesses, from the current soft rubber to rigid hard-plastics. These could be used for vehicle parts, composite materials, and even body armor.